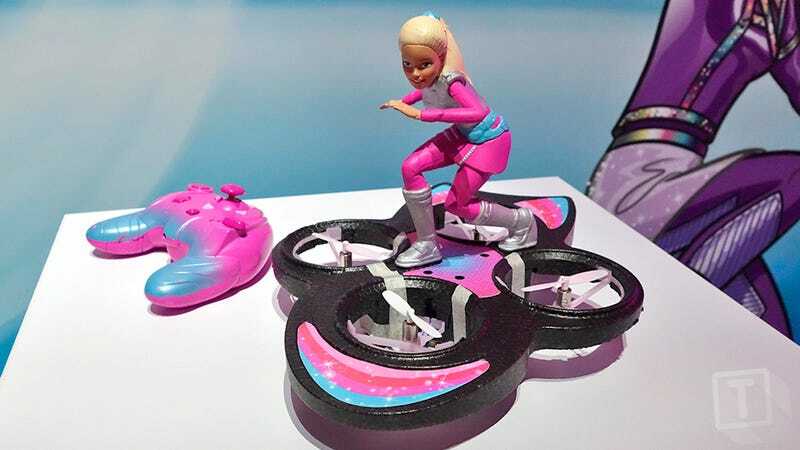 The smell of melting plastic is particularly unpleasant, so instead of putting Barbie on a two-wheeled self-balancing contraption prone to melting down, Mattel has given Barbie a hoverboard that legitimately takes to the air. Available in the fall for $60, Barbie’s hoverboard is essentially a remote control quadcopter drone with a lightweight foam version of the iconic doll perched on top. The drone’s flight characteristics have been tweaked to accommodate the extra weight up top, and to ensure it can still be easily flown by kids aged eight and up. As far as hoverboards go, it’s still not quite the same thing that Marty McFly got to zoom around downtown Hill Valley with in Back to the Future II—his hoverboard didn’t come with a matching pink wireless controller. But it does indeed hover, that’s confirmed, and that this point we’ll take what we can get.